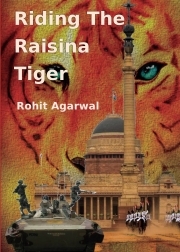 Description of "Riding The Raisina Tiger (Hard Cover)"
The story of Gen Raghavan, an upright, no-nonsense soldier who is looking forward to a peaceful retired life. An unexpected turn of events leads to him being appointed as the chief. He finds himself in confrontation with the prime minister, who is leading an unstable, corruption ridden government. He learns that the prime minister is planning to take certain decisions that would be irrevocably harmful to national interest. When his attempts to convince fail, he decides to take things into his own hand. Reviews of "Riding The Raisina Tiger (Hard Cover)"
What a great story. The plot was really gripping. The book was unputdownable from the time I picked it up. In one sitting from the afternoon to late night. This has happened after a long time. Your skills are phenomenal. The narration was easy and lucid. Excellent use of the 'poetic licence' in the plot. The story has been woven around some famous and memorable events in the recent past. Our congratulations for such a wonderful effort. Hope to see the book doing well. Wish the Author great success in his literary works.